An auction in London is featuring a custom 12.9-inch iPad Pro and accompanying Smart Cover, Apple Pencil and holder as one of its lots, as donated by Apple SDO Jony Ive and his design team. The special iPad will be one of 39 lots in the upcoming "Time for Design" auction being held by the Design Museum, in collaboration with Phillips, to help fund relocation efforts, Wallpaper reports. 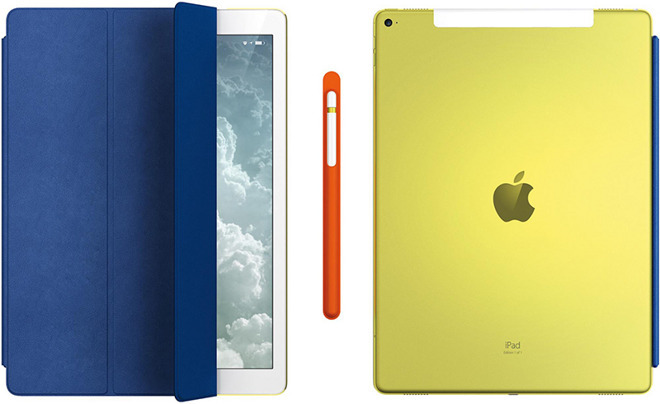 Laser engraved "Edition 1 of 1," the iPad Pro features a custom yellow gold anodized chassis and comes with a matching blue Smart Cover crafted from French leather. An Apple Pencil with similar yellow gold gilding is also included and comes with an orange made from Italian calf leather. Ive's relationship with the Design Museum goes back decades. The famous designer showed off a prototype mobile phone at the museum in 1990, just two years before he made the switch from Apple contractor to employee. In 2003, Ive won the museum's first "Designer of the Year" award for his work on iMac. Owning the collection comes at quite the premium, however, as the lot is estimated to sell for between 10,000 pounds and 15,000 pounds, or $14,200 and $21,300. The Time for Design auction will be held on April 28.